“Self-publishing is easy. Writing is hard.” I hear these statements all the time, but I think someone got these beliefs backward. For writers, writing is easy. Self-publishing can be hard. You see, writers write. That’s what they do—or you do. Yes, sometimes you get stuck or don’t feel inspired or good enough to write, but, in general, you can write. Admit it. When it comes to self-publishing your book, though, that’s another story entirely. This task might make you anxious. You may worry that you just can’t do it. It may feel like too big a task—and one you have too few skills to tackle. Indeed, creative types tend to be disinclined toward some of the activities required to publish a book. These include business planning, design, sales, and technology, and that makes these tasks—and self-publishing—feel hard. If you want to self-publish, you can’t just write. To become an indie publisher you can’t just wear a Writing Hat. 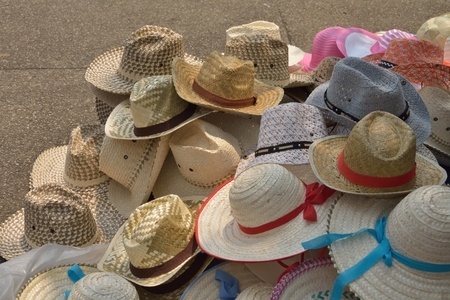 You need at least one or two more hats, such as a Business Hat or a Project Manager’s Hat. Yet, as a writer, you might only own a Writer’s Hat. That might be the only one you want to wear because…well…you only want to write. You feel most comfortable writing, and you don’t want to do the other required tasks you know help a book succeed, like marketing. (That activity requires wearing a Marketer’s Hat.) That’s another reason self-publishing feels hard. The tasks involved in publishing aren’t ones you enjoy. What’s an aspiring indie author to do? Although you may consider yourself just a writer, in fact, you can be or become anything you like. As I wrote about here, succeeding as an author has much to do with attitude. Have you ever noticed how people who wear hats have an attitude? Sometimes they choose a particular hat to fit their attitude or to create one—a baseball cap when they are feeling playful, a fedora when they feel dashing, or a sun hat when they feel relaxed, for example. Adopt this same practice: Choose a hat to help you adopt the attitude you need to help you accomplish a publishing task. Put on your Blogger’s Hat when it’s time to blog. Put on your Publisher’s Hat when it’s time to manage the publication of your book. And wear your Writer’s Hat when it’s time to write. These hats can be imaginary. You’d be amazed at how well visualizing yourself wearing a specific hat works. In the process, you call up the energy of a person good at that task. Physical hats work well, too—almost better. Plus, knowing which hats you need to successfully self-publish helps, too. First, this knowledge gives you an overall picture of the self-publishing process and the skills you need to complete it. Second, when you know which hats you need in your “closet,” you can pick and choose the one you need when you need it. Get comfortable wearing all the hats required to successful self-publish, you’ll discover both writing and self-publishing your book are easy. To approach publishing in this manner, you have to know what hats to wear. Let’s take a look at choices, starting with one you wear at the very beginning of the process. The first task you have as a writer involves ideation. Thus, you must put on an Ideator’s Hat. This hat helps you create the idea for a book. Use it to think up a unique and necessary book targeted at your ideal market—a marketable book idea. Coming up with marketable book ideas (the kind of book ideas that sell), involves the third type of hat I will describe (below): A Business Hat. You need this hat often. One idea is not enough if you want to have a career as an author. You need more than one book idea. Bestselling authors typically write many books, and the more books you write, the more books you sell. Also, if you want to have a say in your book’s cover design, develop a book marketing plan or find ways to monetize your book, you need more ideas and many types of ideas. You Ideator’s Hat will come in handy for all these tasks. You already wear a Writer’s Hat when you do the fun part you know well! Put it on, and write that book you ideated. Keep in mind that since you need to write a book your readers want, you still need to have your Business Hat nearby to pop on from time to time (more about this hat below). Plus, you need to follow a sound structure or story line, and this might still require your Ideator’s Hat. In general, though, once you know what to write and how you will write it, you wear your Writer’s Hat. And this hat should suffice. I suppose while you write you might need a Researcher’s Hat. Or a Storyteller’s Hat. Or even a Detective’s Hat, Killer’s Hat, Guru’s Hat, or Expert’s Hat, depending upon the topic of your book. The third type of hat you need is a Business Hat. (Stick with me…this when many creative types stop paying attention.) This hat not only comes in handy but also is necessary for almost every step of writing and publishing a successful book. As I mentioned, you want to put it on during at least part of your ideation process to ensure you create a salable book. Then you need it as you create the structure and content for your book if you want to ensure you focus on your reader’s needs and interests and produce a book that fills a hole on the category shelf. You most-effectively handle these factors—and more—by producing a business plan for your book, which, of course, requires wearing your Business Hat. This post includes some of the essentials for a book’s business plan, and you can find them all in The Author Training Manual. Wear your business hat to perform a market analysis, a competitive analysis, and develop a marketing plan, as well as a plan to monetize your book. Complete all these activities as part of building you business plan. While you work on your business plan, switch to a Branding Expert’s Hat. Develop your unique selling proposition (USP), determine how you want to be known, and then carry this out with logos, colors, and messaging on your website. That requires that you wear a Webmaster’s or Blogger’s Hat, especially since you blogging provides a way to promote your book (back to the Marketing Hat…). Last, but not least, you need to wear a Publisher’s Hat. After all, when you self-publish a book, you open a publishing company. That makes you a publisher. As such, you need to manage your team, which consists of editors, designers, formatters, and possibly promotion and social networking experts, as well as a website developer. For this, you need a Project Manager’s Hat as well. Lest you feel confused, all of the hats in this section are, indeed, types of business hats. That’s a lot of hats! What if the Hat Doesn’t Fit? I said you needed three but you easily could end up with at least 15 different hats! So get a big hat rack for your office. Wear each hat as the occasion calls for it. Doing so will help you self-publish your book more easily and succeed as an author. What if you find a hat or two, or three, don’t fit? You just can’t get used to wearing them nor can you adopt that attitude that goes with them. In other words, you don’t want to learn that skill set or you aren’t good at that particular skill. No problem. Hand the hat to someone else, and let him or her wear it. Hire someone to do that job! And if you hate the feel of a particular hat—or don’t like how you look in it, again, get someone else to wear it for you! Create a publishing team, and only wear the hats you like or need most, such as your Writer’s Hat and your Publisher’s Hat. Or choose assisted self-publishing. This limits the amount of time you wear any hat other than you Writer’s Hat. Whichever hats you choose to wear to get the job done, when you release your self-published book, you’ll be able to put on a new one: your Successful Author’s Hat. I can guarantee that one will fit you well and feel fabulous! I’m learning to feel comfortable with the many hats. I fought it in the beginning, but not now. In fact, I just joined a business networking group, and every week I get together with the bankers, and lawyers, and yoga studio owners and we talk about our ‘business’ and how we can get referrals for each other. This hat feels a bit strange on my head, but I’m getting used to it. That’s fabulous, Pamela! What a great idea…to just BE a business and associate with other business owners. You will learn a ton!